And where do u get one such thing. And what if the truck already has alarm. All the prices I've seen are 300 to 400. But maybe WE aren't savy enough to know where to look? But some people over pay for other things that others can get cheaper but nobody says where to get such items. But we will tell others they pay to much but not help everyone save. That's not an alarm issue, that's an install issue. Shock sensor was set too sensitive. Super simple thing to resolve. Changed out the black roof rack for silver/grey, it matches better with the graphite wheels and the rest of my silver/grey trim. Also put on the Borla exhaust to compliment the TRD performance intake. Not as a significant a feel in throttle response as when I did the same to my Tacoma. But it looks and sounds cool. We will see if there is any improvement in MPG. 417tundra, siblue, WallyT4R and 1 other person like this. WallyT4R, jester243, Living the dream and 1 other person like this. Installed a cargo deck I swaped with a fellow member from the forum. Kudos to ScotTRD for making the swap possible and an awesome guy as well! Kritsana21 and Crusifix like this. Anyone with a streamline front bumper? Project off-road trailer is a roller now. I've still got to fab some fenders, and completely redo the box, but it is coming along. SgtReckless, Hammer, Run4TheWoods and 11 others like this. Looks pretty cool so far. What did you do to fit those wheels and are those wheels staying on it? I made a perch that allowed me to move the axle from on top of the leafs to under the leafs. I welded that onto the axle. This gave me about 5" of lift. Then a just used a set of hub adapters so I could mount the wheels. I've had these wheels since 2004, and figured that I would put them to use. Eventually I want another set of TRDP wheels, so these can double as spares if needed. Right now they are not compatible. Thanks! 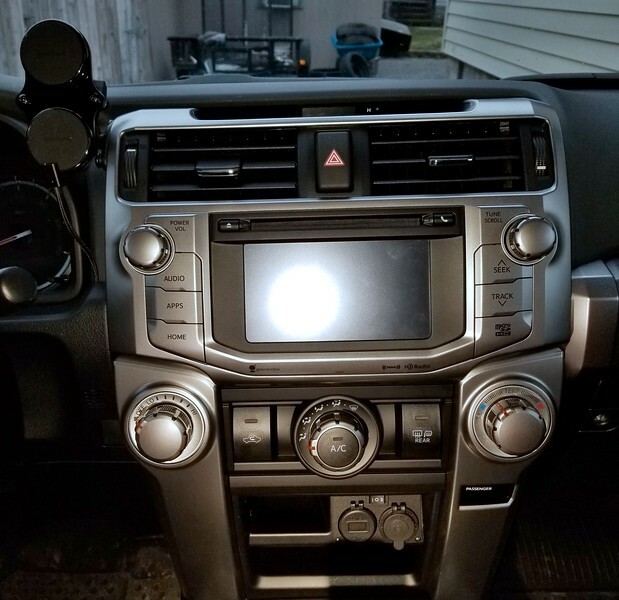 Backslider, HoBoDanny and 2016 4Runner SR5 like this. WallyT4R and Crusifix like this. Nice, I'm about to start on something similar. Keep us posted on your progress! Crusifix and HoBoDanny like this. I may try to get all of the pics together and start a build thread. Thanks for the positive reviews! WallyT4R, Kyblack76, ManBeast and 3 others like this. It'll look even better once some TRD wheels are on it. Maybe paint the trailer Inferno to match your truck? Snickel Fritz, Crusifix and HoBoDanny like this. 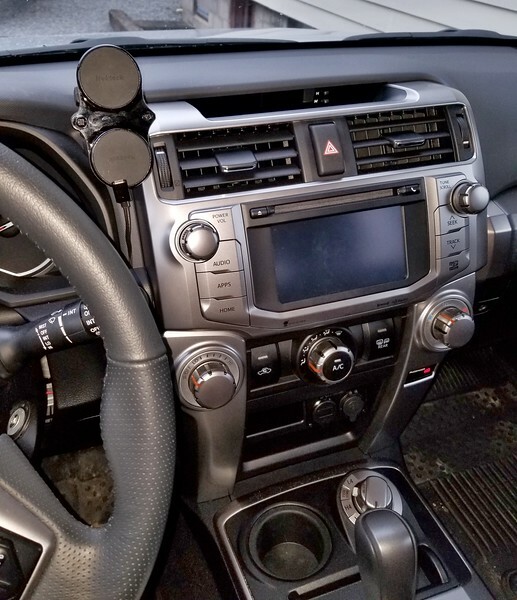 Installed a RAM mount for my phone, with magnetic holder. Also replaced the front factory cig plug with a nicer one, thats hot all the time. 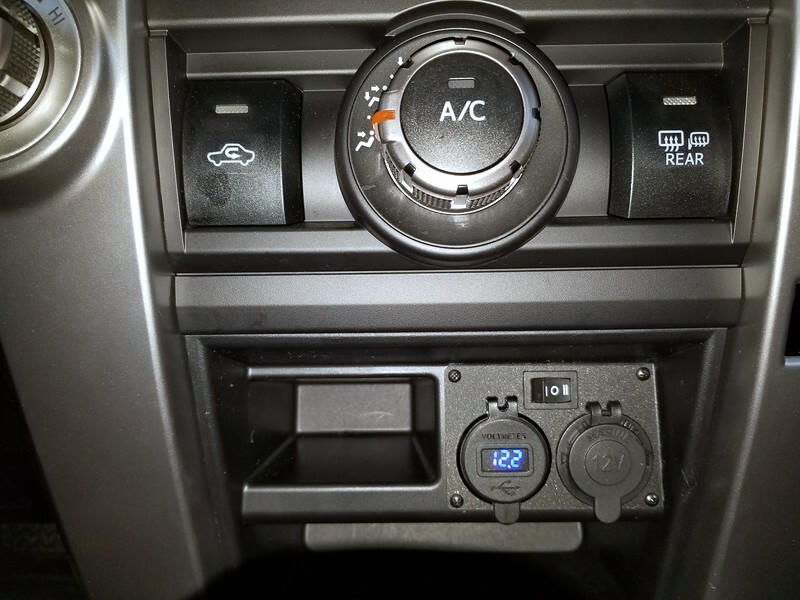 Added a USB charger next to it, with voltage meter, that can be switched from full time hot, to acc. power. Hammer, MattMo, nimby and 7 others like this. Yeah we need a detailed separate thread write up of this with part numbers and did I mention, details. Thanks. Hammer, golfguy and HoBoDanny like this. I can make a thread on it if you guys want. Basically, as far as just getting the cig plug to be full time, I used an Add-a-Circuit and plugged it into an unused spot on the driver kick panel fuse box. Used a multi-meter to find one that was always hot. Then just cut the positive wire at the cig plug, and connect the one from the Add-a-Circuit. I used the acc. power that was going to the cig plug to connect to the switch I added. One position of the switch sends acc. power to that USB/volt meter, and other switch position sends full time power to it. But again, if all you want to do it make that cig plug always hot, just use the add-a-circuit and connect it. Hammer, Crusifix, ManBeast and 1 other person like this. Well that's the easy part . 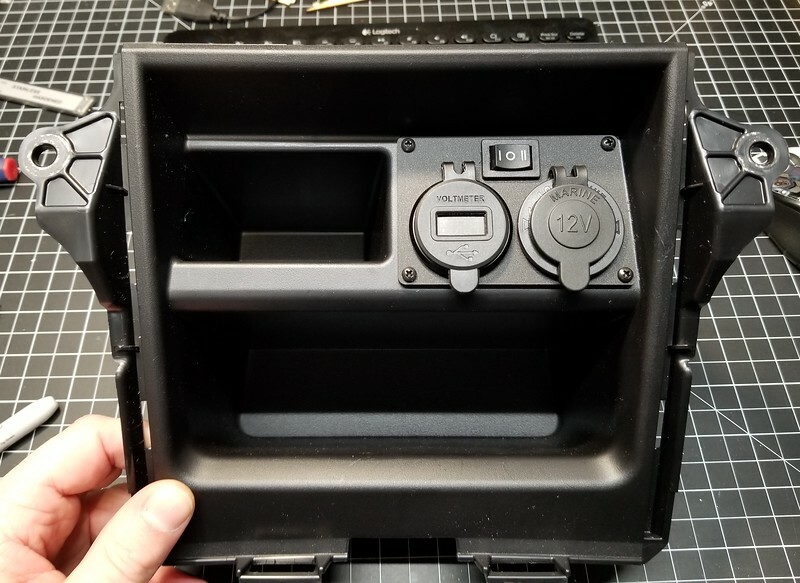 I would like to see a writeup so you can show us all the other parts you used, the plate to mount the plugs, wiring the voltmeter, how you pulled the dash apart, specific part numbers, etc, etc, etc... But it's ok if you don't want to. I think stuff like this needs catalogued. It's just good information to have on the site. There is an always-hot, unused fuse? I didn't think to check... This will be helpful as I'm adding a couple USB ports to a switch blank so I can run some lighting and other small stuff when camping. Thanks for posting this. Hammer and WallyT4R like this. I didnt think people would be this interested in this, and that similar had probably been done on here. I should have made a video on it, I have some other mods planned, so I will video those, and try to go back over this one as well. The plate I designed and cut out on my laser engraver/cutter. I THINK I saw a post on there somewhere, but cant find it now. If they are all fed off the same circuit slot on the fuse block then that might not be tough to do. I just didnt want them all hot, just that one in front, and I will be running full time hot to the rear and adding one on the driver side, for a fridge. Hammer, ManBeast, WallyT4R and 1 other person like this. You will want to add a switch to that USB charger !!! They will draw some small amount of power even when nothing is plugged into them usually. It might take it a while to drain a battery,, but it can. Thanks for letting me know - I have no problem testing, I just hadn't thought to do so and used an add-a-fuse in existing/used slots for my switch lights and my front and rear dash cams... I don't know why it didn't cross my mind to check the unused slots. 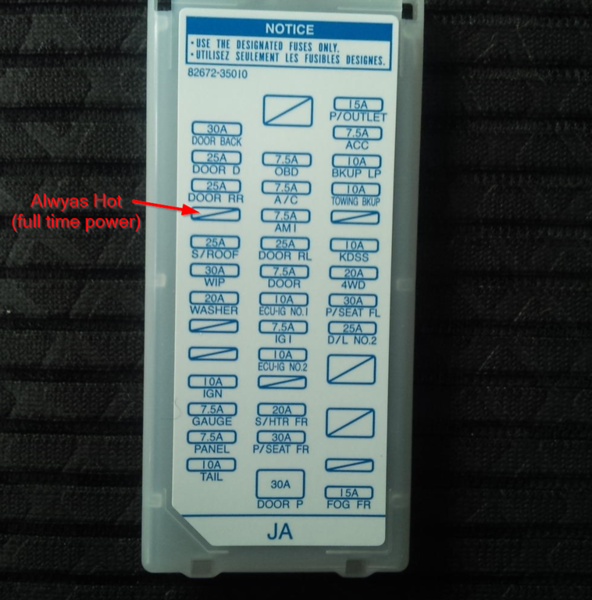 I just bought an Odyssey group 34 battery - you think I need to worry about a switch? With such low voltage do you think it's safe to run the switch inline with no relay? No matter what battery you have, I dont like the idea of something being able to pull power when not in use. I would think it would days days, weeks to drain it maybe,, but, it can. A switch inline with it would be fine for something like a USB charger. Relays are really only needed for things drawing quite a few amps, like light bars, most switches can handle several amps. Should probly check your brake fluid level.